Stallion Alert - Record Collecting - Portland, OR: Tacoma/Seattle Record Store Road Trip, Part One. I'm back! And I'm feeling refreshed and ready to take this blog on again. So get your bookmarks and your RSS feeds ready, because I'm postin'. During my lengthy vacation from blogsville, my brother was in town. 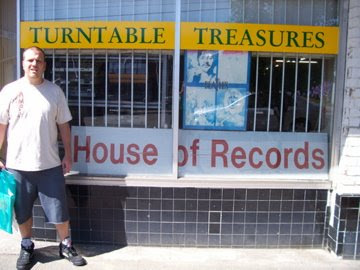 He moved to AZ a few years back, and often misses the NW record stores. So, since I'm sick of all the ones in Portland (except for Crossroads), we decided to give ourselves the sweet mission of hitting as many Washingtonian record stores as we could in one day. Armed with Mapquest directions, coffee, and expendable cash, we set out at 9AM this past Tuesday to do just that. Here's how it went. 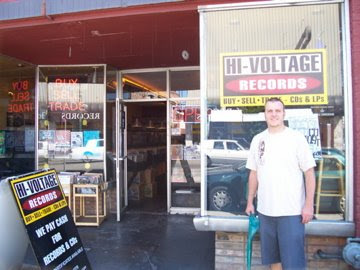 Hi-Voltage is (along with the next four spots we hit) on 6th Ave. in Tacoma. It's small, nicely organized, and has a ton of vinyl. While their prices are a bit on the inflated side, their selection almost warrants it. Almost. I had been there a few months earlier and begrudgingly paid ten bucks for a Hazel 7" that I had long been searching for, and I wasn't really looking to do that again. After combing through the rock and hip hop, I ended up leaving with a decent copy of Run-DMC's Raising Hell, which I have been needing for a long time. There were some other records I wanted, but the prices were high and this was only our first stop. We didn't want to go too nuts at the beginning. I would have liked to have, though. This is a great little shop and well worth checking out. Doesn't seem like a hip hop place, but they have a nice selection of old school rap. Located right across the street from Hi-Voltage, TT&HoR is a place that I could easily spend a whole day in. Their organizational methods are tough to grasp at first, but once you get the hang of it, it's great fun to dig around. I've been in there a few times, and the gents who work there are always really nice and happy to help. This place specializes in 12" vinyl, so if you're looking for CDs, you're not going to find much here. But if you're looking for original sealed copies of 20-year-old LPs, this is the spot. They also have racks of everything you can imagine. The last time I was up there I picked up a Rob Base & DJ E-Z Rock LP and a Faith No More 12" single on blue vinyl. And I almost bought a Donnie Most (Ralph Malph) LP, too. Like I said, they've got a ton of stuff, and the variety is impressive. I'm already looking forward to the next time I can go up there with a hundred bucks and go crazy. This time around I picked up a Simple Minds "Alive and Kicking" 12" import single, a Men at Work "Everything I Need" 12" promo single, and a copy of Run-DMC's King of Rock that is in pretty good shape. (My brother bought some stuff too, but I can't remember what.) This store is fantastic. Set aside some hours and do it right. 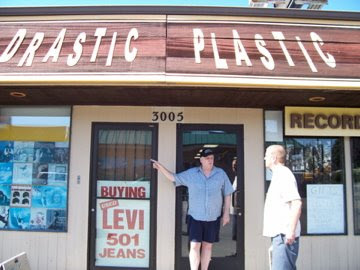 After hopping back in the car and driving a few blocks, we came up on Drastic Plastic, which seemed to be open, but it wasn't until we set foot inside the place that we were able to confirm this. Upon walking in, we saw a table full of 7"s, a mini head shop filled with pipes and bongs, baseball cards, CDs, videos, role playing card games...a ton of random stuff. But no LPs. After inquiring, we were granted access to the darkened room adjacent to the main one, which housed multiple racks of records and several racks of used blue jeans. An odd mix, for sure, but it really didn't seem that nuts when we were in there. Also odd: there were no prices on the records. Dude told us that he would just tell us what the prices were. I really don't care for that approach, as it often leads to awkwardness and disappointment. Their selection of rock was standard, but they did have a nice selection of oddities and unclassifiable albums. I picked up WWF's The Wrestling Album, an instructional LP called Train Your Bird to Talk, and Belante's Mr. Hypnosis, which is a bizarre weight control and self-confidence hypnosis record from what looks like the 60's. The guy who was working in the store was quite chatty, and as you can see from the photo, he followed me out to the street when we left, still talking away. That was an experience. Across the street from Drastic Plastic lies Golden Oldies, a tiny little shop that is very clean, very well organized, and focuses on...you guessed it: black metal. Nah, I'm foolin'. If you're looking to up your Kingsmen collection, this may be the place to start. 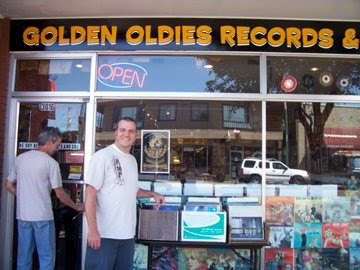 But the nice guy who runs this place (seen here opening the door for us after coming back from lunch) also keeps a healthy stock of vintage comedy records and some stuff that definitely fits into the Classic Rock category. So, not really what I was focusing on for this trip, but I did end up leaving with a sweet signed copy of Jimmy "Mouth of the South" Hart's Outrageous Conduct, which I didn't even know existed. Score. And, there were some well-behaved dogs that kept us company in there while we flipped through the vinyl. A nice experience, I must say. I think this may have been the only place that we left without buying anything. 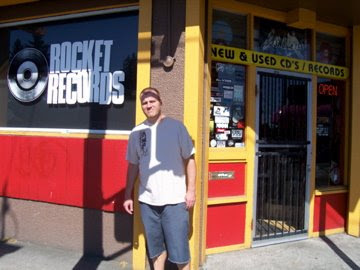 Rocket Records is a great space, but their prices are inconsistent and there's just too much jammed in there. Though I have to say, if I had a few hours to kill flipping through their dollar bin, I'm sure I could find some stuff I wanted. As it was, we didn't have much luck. The stuff is ostensibly divided by genre, but after flipping through some of the crates, there didn't seem to be much care put into really organizing the stuff. And the multiple "new arrival" sections were a bit confusing. I think we were also concerned about getting to Seattle at a decent hour (by this point it was almost 4PM), so maybe we didn't give it a fair shake. I'm going to head back there the next time I'm in Tacoma and hit that dollar bin. So that was Tacoma. Next stop: Seattle! Mrs. Johnny and Mrs. Biff stayed in PDX and went makeup and shoe shopping. It was glorious.